The Grainfather Conical Fermenter Pro Edition - 7 gal. $694.99 & FREE Shipping on orders over $59. Whether you’re new to their products, or you’re a Grainfather Electric Brewing System diehard, this fermenter is sure to take the quality of your brew to new heights. MoreBeer! 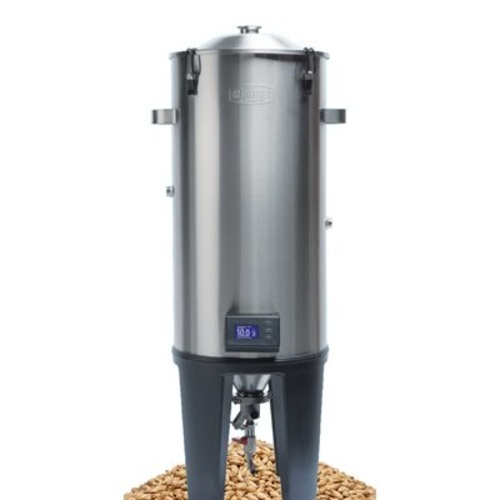 is proud to offer the Grainfather Conical Fermenter Pro Edition. But be warned: this is not your Granpappy’s fermenter. Brewer’s turn to conical shaped fermenters when they desire an easy way to dump and harvest yeast, and Grainfather took that mentality a step further with the purpose built dual-valve bottom tap. Where other dump valves can leave a mess behind, this uniquely designed bottom tap makes yeast harvesting, sampling, and transferring a clean and convenient process. Temperature control has been well documented as an essential part of the fermentation process, and the Grainfather Pro Edition Conical turns this critical stage into a leisurely enterprise. Not only can you adjust the temperature with the push of a button, the Temperature Controller on the Pro Edition can be programed with up to four unique schedules, so you don't have to remember to step up the temp on days 3 and 5. Set it, and forget it! For even more control, upgrade with the Cooling Pump Kit (FE234) to manage cooling. With an 8 gallon maximum capacity, you can ferment even the highest gravity 5-gallon batches without the risk of krausen blowing out the top. And thanks to the double-walled 304 stainless steel body, this unit aims to remain in the family for generations to come. Double Walled: A stainless steel double walled skin is filled with a thick layer of polyurethane foam for insulation. This is what keeps the wort at a constant stable temperature with minimal influence from any external environmental temperature changes, providing insulation for your fermentation that a standard jacket cannot achieve. Integrated Gentle Heating: In the cavity of the fermenter between the outer body and cone sits a 30 Watt, 12V heating element. Unlike standard heating elements/sources that directly heat the liquid, this heat source is designed to heat the environment in between the walls of the fermenter, which in turn heats the liquid. It is similar to controlling the temperature in a temperature controlled room. The fermenter acts as an artificial environment which can be heated, meaning the temperature is raised in an even and controlled manner which is much better for the yeast. Integrated Cooling Sleeve: In between the two stainless steel walls sits a cooling sleeve (also made of stainless steel). This cooling sleeve is welded onto the inner wall of the fermenter and can be hooked up to the additionally purchased Glycol Chiller. Temperature is dialed into the Temperature Controller and as the cooling liquid travels through this sleeve, it cools the stainless steel which in turn evenly cools the beer in the fermenter. The cooling sleeve never comes into contact with the beer, it is completely concealed, built into the fermenter and never needs cleaning or sanitizing - a true innovation for a fermenter of this scale. Easy Access to the Interior for Hassle Free Cleaning: The Grainfather Conical Fermenter has a smooth interior with no additions such as cooling coils or additional sampling valves meaning it is easy to clean and minimizes the risk of infection. Golden Angle Conical: The conical shape of the fermenter is typical for professional breweries. Our conical has been designed with the 'Golden Angle' of 60º. This is the optimum angle for yeast and sediment to drop down to the bottom of the cone without getting stuck to the sides, allowing you to transfer from above the sediment line, resulting in clearer beer. The conical shape also allows for better mixing during fermentation due to the path of convection currents that it enables to occur. Dual Valve Tap: Make the yeast dumping, transferring and sampling process more professional with this innovative all in one valve. Sampling and transferring is done through an inlet above the sediment line, allowing for clear, sediment free beer. Easily collect your yeast from below the sediment line with the same unique valve for recultivating and pitching. The innovative design of the valve allows for this dual functionality and less cleaning for you. Temperature Control: The Temperature Controller easily snaps on and replaces the standard Temperature Display via magnets and pogo pins. Allowing you to accurately dial in a temperature and even set a temperature schedule/profile (you can set up to 4 profiles each with 5 stages). It can control the heating of the integrated heating element and the cooling (if you have upgrade to the Glycol Chiller). After reading a lot of reviews, decided this was the best fermentation system on the market for the home brewer.